The 30th Anniversary opens with Michael Oliver in reminiscing mood at home - and there are tales to be told by a man who has been the driving force of this show since it's conception! Ongoing publicity during the year on Poole Quay; "period harvesting"- Dickie Plummer, Titan tractor & binder; selection of preparations incl. 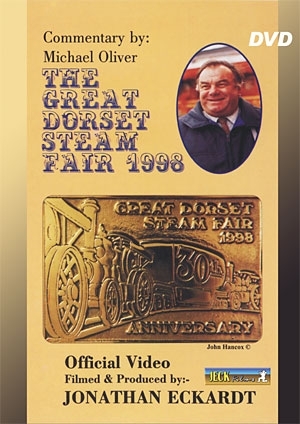 "Mighty Mouse"; Dr. Busker with" heavy mob" at the Fox & Goose; Doc Romanes and the "Holy Grail"; "Old Mac", the engine which left England for Ireland in 1878 to return for the first time this year; tractor pulling as never seen before; the 1903 Ericson Stationary Engine; a Dutchman fastening his lady customer to his finger with his special glue; another with some gruesome medical instruments; the only three engines to have attended every Great Dorset; lots of action at the horses, the musical drive of the carts; the Bernese mountain dogs; the great entertainment on Saturday night. Period harvesting with a Titan tractor & binder. Dr. Busker with" heavy mob" at the Fox & Goose. "Old Mac" the engine which left England for Ireland in 1878 to return for the first time. Tractor pulling as never seen before. The 1903 Erickson Stationary Engine. The only three engines to have attended every Great Dorset .